Model DWT1305 Deadweight Testers are dual range, precision built hydraulic instruments for testing, setting, calibrating or repairing pressure measuring devices. Each instrument is self-contained and comes complete with tools and metal carrying case. 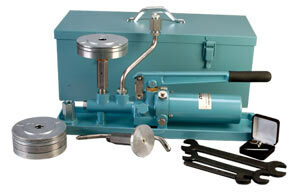 With the "-CAL-3" calibration option, the DWT1305 can by a primary standard with 0.1% accuracy of the pressure produced. Each unit is adjusted for standard gravity conditions, all weights are labeled and a NIST traceable certificate with no data points is supplied. Nota: Each unit Includes: hydraulic pump, weight set, two piston/cylinder assemblies, three wrenches, spare O-rings, piping and fittings, rugged carrying case and complete operator’s manual.